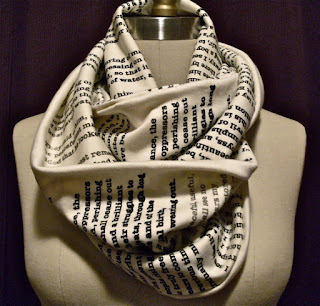 Why We Love It: We here at FMF love fashion and books. 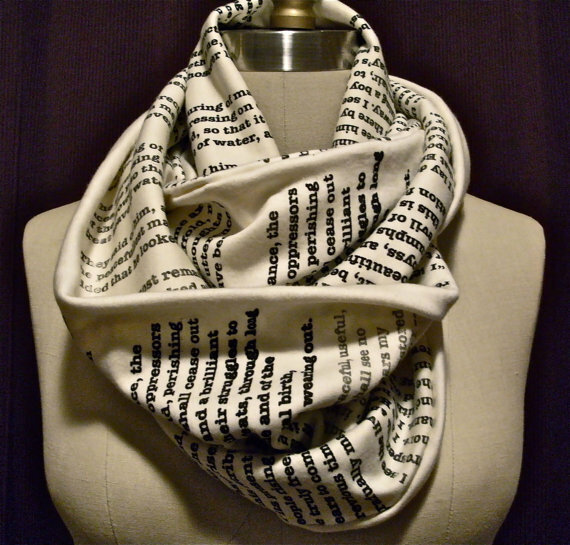 This shop creates scarves with excerpts from classic literature. It's a perfect combination. I think I really need one of these. I just have to decide if I want Pride and Prejudice, Jane Eyre, A Tale of Two Cities or Persuasion. Currently, these are the only styles they are offering and custom orders aren't being accepted until sometime in the future. Jane Eyre for the win. I wonder if whether they will also come up with their own version of Nathaniel Hawthorne's necklace in his book Scarlet Letter. That would sound controversial but interesting at the same time, wouldn't it? I hope they consider doing it though. Just my two cents, I would not spend more than ten dollars for a scarf. I would rather give charities that amount of money, at least I would know that they are spending it on good things. Jane Austen always equates with classic, memorable, and vintage. This is an interesting concept for a scarf, perhaps it'll also work with a home inspiration or something. It does looks good and classy.